Even at an early age Adolf Galland was greatly interested in flying. When he graduated in high school it did not come as a surprise that he was one of the students to join the Germanyï¿½s national airline which was Lufthansa. His interest in flying did not just end there so he continued his pilot training. Although he feared he would be sent home due to poor performance, he continued to do his best in his pilot training and the rest has become legend. Adolf Galland was born on March 19, 1912 in Westerholt which is now named Herten. His parents were Adolf Galland Senior and French Anna nï¿½e Schipper. He graduated from Hindenburg Gymnasium High School on February 1932. He was among the 20 students who were accepted to join the aviation school of the national airline of Germany which was Lufthansa. Adolf Galland was the second child among 4 siblings namely Fritz (his older brother), Wilhelm-Ferdinand and Paul. His father loves to give each one of them pet names including their mother Anna. His father would call Fritz, Toby, Adolfï¿½s pet name was Keffer, Wilhelm-Ferdinand was called Wutz, Paul was called Paulinchen or sometimes Paula as they were expecting to have a girl and of course Anna was called Anita. He was smitten to Baroness Gisela von Donner but she refused to marry him because she would be deprived of her former husbandï¿½s wealth and her freedom. On February 1954, the same year that Donner left, he married Sylvinia von Dï¿½nhoff. The marriage didnï¿½t last long because she was unable to bear any children. They were divorced on September 10, 1963. That same day, he married his secretary, Hannelies Ladwein. They had 2 children namely Andreas Hubertus who was born on November 7, 1966 and Alexandra Isabelle who was born on July 29, 1969. The marriage didnï¿½t go well so on February 10, 1984, he married Heidi Horn. She was his last wife and took care of him until his death. 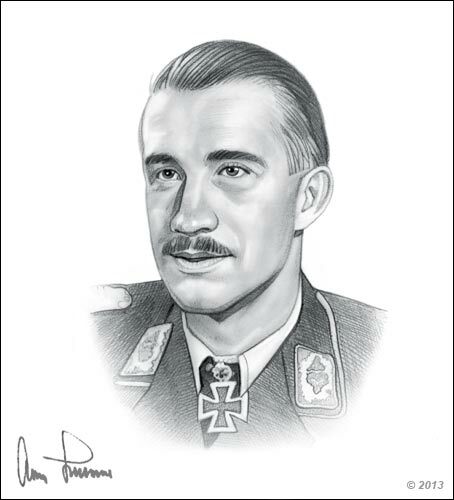 Adolf Galland flew a total of 705 combat missions. During these combat missions, he was shot four times but was fortunate enough to survive relatively unscathed. He won 104 aerial battles against the Western Allies. He started as a glider pilot in his early years and later joined the Reichswehr of the Weimar Republic later in 1932. 5 years later, he volunteered for the Condor Legion and was assigned for ground attack missions for the Nationalists under the leadership of Francisco Franco. During World War II, he convinced his superiors to allow him to be a fighter pilot although he was older than the normal age for fighter pilots. In the Battle of France and the Battle of Britain, he had a total of 96 aerial victories which earned him the Knightï¿½s Cross of the iron Cross with Oak Leaves and Swords. 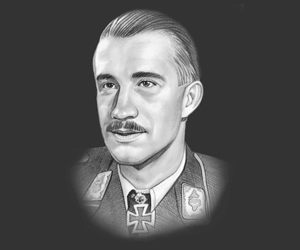 In 1945 he was given the Knight's Cross of the Iron Cross with Oak Leaves, Swords and Diamonds for commanding the Jagdgeschwader 26. He continued to fly on numerous missions until the end of WW2 in May 1945. Early February 1996, Galland was taken seriously ill. He wanted to die in his own home so he was sent home with the approval of the hospital. He died 1:05 AM on February 9, 1996. He was buried 9 days after his death at St Laurentius Church, Remagen-Oberwinter. A memorial service honouring his service was held on March 31, 1996. Adolf Gallandï¿½s leadership and bravery had greatly influenced the fighter pilots to do their best in any assignments they are assigned. They have to remain focus and keep the interest going so they would achieve and succeed on any tasks they would do. This picture of Adolf Galland is Copyright ï¿½ June 2014 Siteseen Ltd. We only allow this picture to be used for printed non-commercial purposes and particularly encourage it's use for printed educational non-commercial purposes. This Adolf Galland picture is not in the Public Domain. 3) Use of this Adolf Galland picture, or any of our pictures on websites re-distributing copyright free material is strictly prohibited.